Director of the federal Centers for Disease Control and Prevention Dr. Tom Frieden. What do the infectious disease MERS, ebola, measles, multi-drug resistant tuberculosis, c. dif and CRE have in common? 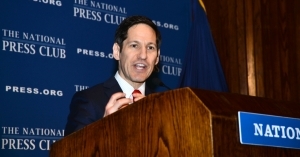 It is the kind of question that can only come from the director of the federal Centers for Disease Control and Prevention and National Press Club luncheon speaker Dr. Tom Frieden. In fact, the director said that MERS virus was spread largely in Middle Eastern hospitals. Luckily he reported that the disease is being controlled thanks to good infection controls at the hospitals, citing communications with the Saudi Arabian minister of health, who said no healthcare workers have picked up the infection in the past ten weeks. The speech was peppered with personal anecdotes such as his staff’s encounter with pythons, cobras and bats in a cave in Uganda, where the CDC is trying to control ebola and the related disease Marburg. Frieden even critiqued the media’s coverage of the discovery of a vial of smallpox on the National Institutes of Health’s campus in Bethesda. Ultimately, it was a serious speech focused on hospital-acquired infections and antimicrobial resistance, which the director has firsthand knowledge of, due to his encounter with antibiotic resistant shigella that caused him to shake so violently that his bed shook. “We talk about the pre-antibiotic era ... . If we’re not careful we will soon be in a post-antibiotic era. And in fact, for some patients and pathogens, we’re already there” he said, adding that antimicrobial resistance creates at least $20 billion in healthcare costs every year. In addition to the direct harm, the problem threatens the 1 million Americans who receive chemotherapy or dialysis every year, he said, explaining that those treatments often weaken the body’s defenses. He announced that “this week CDC will be launching for the first time a system that will allow any hospital in the country to track electronically, automatically with no extra work after the initial uploading work, all of the antibiotics dispensed in their hospital and all the antibiotic resistance patterns" of patients who have infections, and said that system will empower doctors to make the right decision. Frieden stressed the importance of containing the diseases at hospitals and following the motto of do no harm: “We know that team-based care, checklists, reporting feedback, accountability, these are all simple management tools that need to be applied systematically to prevent drug resistance.” He cited a study done by the agency which found at that a third of all antibiotics used in hospitals in this country are unnecessary or inappropriate. On the policy front, he said President Barack Obama’s 2015 budget calls for $30 million a year over five years to build five regional centers of excellence to help doctors deal with the problem of drug resistance. Of course the idea has to be funded by Congress to become reality. With the initiative, CDC “would be able to cut our two deadliest threats in half, both CRE, the nightmare infection that’s spreading in many of our intensive care units, and c. diff. And we know that because places that have done this right have had that result. We can make this succeed across the country, but only with investment,” he said. Another problem in the fight against disease is the lack of new antibiotics. “We do really have a problem with incentives. From a strictly business standpoint, a terrible thing about antibiotics is that they cure people and then you stop taking them. That’s not a model for a highly lucrative pharmaceutical product,” he said, adding that Congress has taken steps to improve the incentives, but that more dialogue between government and industry is needed. After Frieden finished talking about antimicrobial resistance and other topics that he wished to address, the conversation turned to more uncomfortable topics towards the end of the Q&A session. The director expressed concern that it took six weeks for news of bird flu mishap to move up the CDC’s chain of command and said the agency needs to do a better job “of encouraging a culture of safety.”  He also said the CDC has stopped shipments of all biological materials from its high containment labs until he personally approves them.